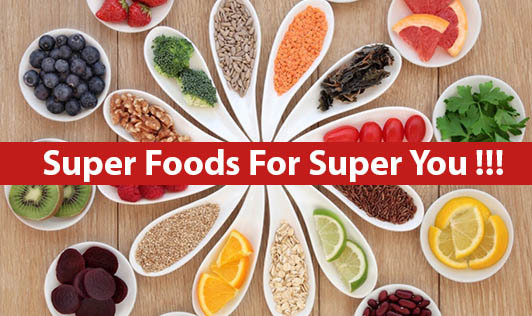 Super Foods For Super You !!! We all have heard that superfoods are great for our overall health. But, no one food can single-handedly improve a poor diet or lower our risk of chronic illness. Eating a variety of fruits and vegetables along with a healthy balanced diet is the key to good health. But certain foods do provide greater health benefits than others. We refer to them as “superfoods.” A superfood is a nutrient-dense food that is loaded with vitamins, minerals, fiber, and antioxidants that are beneficial for good health and well-being. Superfoods help fight infection, enhance the immune system and protect against diseases such as osteoporosis, heart disease, certain cancers, diabetes, and respiratory infections. Dark Green Leafy Vegetables - Dark green leafy vegetables (DGLVs) like spinach, parsley, broccoli, kale, etc. are an excellent source of folate, zinc, calcium, iron, magnesium, vitamin C and fiber. They have the potential to reduce the risk of chronic illnesses including heart disease and type 2 diabetes. They also contain high levels of carotenoids, an anti-inflammatory compound that may protect against certain types of cancer. Eggs - Eggs are rich in many nutrients including B vitamins, choline, selenium, vitamin A, iron, and phosphorus. They’re also loaded with high-quality protein and antioxidants like zeaxanthin and lutein. Salmon – Salmon, rich in omega-3 fatty acids, helps to reduce blood pressure and cholesterol levels, improves memory and promotes emotional balance. It is also low in calories and saturated fat and high in proteins and vitamin B, potassium and selenium. Nuts and Seeds - Nuts and seeds such as almonds, walnuts, flax seeds, sunflower seeds, chia seeds, etc. are rich in fiber, protein, and heart-healthy fats. They also have anti-inflammatory and antioxidant properties. When eaten in moderation, they help in reducing our risk of heart disease and support weight loss. Yogurt - Yogurt contains probiotics or "good bacteria" that helps keep our guts healthy. It is rich in protein and calcium. It also contains phosphorus, potassium, zinc, riboflavin, vitamin B12. Oats - Oats is a complex carb rich in fiber, proteins, vitamins, and minerals. Eating oats is an easy way to increase fiber intake. Fiber is good for our gut and our waistline. It helps in lowering cholesterol levels, preventing overeating and keeping us full. Quinoa – Quinoa is a superfood packed with proteins, fiber, vitamins, minerals, and other vital nutrients. It is flavorful, easy to digest and gluten-free. Daily servings of quinoa and other whole grains may lower your risk of diabetes and heart failure. Garlic – Garlic is a good source of manganese, vitamin C, vitamin B6, selenium and fiber. It is effective in reducing cholesterol and blood pressure, as well as supporting immune function. Sulfur-containing compounds in garlic may help in preventing certain types of cancer. Ginger – Ginger is used as both, a culinary flavor enhancer and for multiple medicinal purposes. Ginger root contains antioxidants, such as gingerol, that is responsible for many of the health benefits. Ginger is effective in managing nausea, reducing pain from acute and chronic inflammatory conditions, reducing the risk of chronic illnesses such as heart disease, dementia, cancers, etc. Turmeric – Turmeric used in cooking has many medicinal benefits. Curcumin, an active compound in turmeric, has antioxidant and anti-inflammatory properties. Curcumin may be effective in treating and preventing chronic diseases such as cancer, heart disease, and diabetes. It also aids wound healing and pain reduction.